The Food and Drug Administration has issued a warning after a dozen people were hospitalized, some in Arizona, with bacterial infections after unapproved stem cell treatments. Consumer Reports has important safety tips to help keep you and your family safe. 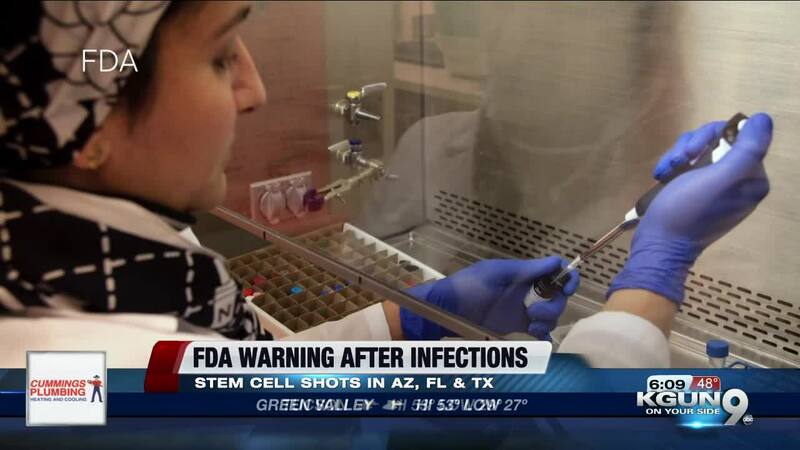 TUCSON, Ariz. - Health officials say patients in Arizona, Florida and Texas suffered from bacterial infections after getting unapproved stem cell shots contaminated with E. Coli and other bacteria. The FDA says it is "focusing more resources on enforcement when we see companies skirt safety measures and put patients at risk." That statement is no doubt a reference to the booming network of private clinics that are promoting and administering stem cell therapies for unapproved and unproven uses like treating COPD or diabetes. In fact, stem cell treatments are only widely accepted to treat blood disorders like leukemia and some forms of anemia. But if you are considering stem cell therapy, how can you tell if it is legitimate? One of the first tips: Beware of big price tags. "Clinical trials for stem cells don't usually have flashy advertisements, don't promise to be a cure all and shouldn't cost you big bucks," says Consumer Reports Health Editor, Lauren Friedman. Also, experts say don't just settle for patient reviews. "A doctor working with stem cells should be able to tell you where the stem cells are from, what's being done to them before they're being injected into your body and exactly how they'll help you," says Friedman. And finally, read the fine print. "If the stem cell treatment you're considering is a clinical trial, make sure the FDA has given it a green light as an IND," says Friedman. That's an Investigative New Drug Application. And the FDA advises patients to ask to see the approval letter to make sure it's been issued for the treatment you're considering. Treatments that have this approval are much more likely to be safe than those without it. Health officials also stress that there are safety risks, even if your own stem cells are used in the treatment. Those include: Failure of cells to work as expected and the possibility of tumors. If your stem cells are manipulated after being removed, there's a risk of contamination and infection.